Set along the shores of the brilliant blue waters of Lake Keowee, The Cliffs at Keowee Springs pairs a relaxed, recreational lakefront lifestyle with energy and culture, embodied by the community’s neighboring college town, home to Clemson University. From its Tom Fazio Signature golf course designed for families and players of all skill levels, to the easygoing environment and casual fare at The Porch, Keowee Springs is one of The Cliffs’ most family-friendly communities. Send me more information about Keowee Springs! Multi-generation fun and adventure on Lake Keowee. Lake life is front and center at The Cliffs at Keowee Springs. With breathtaking views of the Blue Ridge Mountains, Lake Keowee is an 18,500-acre gem. Perched on a hillside overlooking the crystal-clear lake, The Beach Club at The Cliffs at Keowee Springs is a hub of activity from spring to fall as members and families soak up the sunny days. While kids play on waterslides and the water trampoline or kayak and paddle-board, adults can enjoy a light meal and beverage from the pool-side grille while lounging beside one of the club’s two outdoor pools. Send me more information about Keowee Springs! Activities begin at the lake and go from there. All the fine leisure pursuits and challenges are part of the Cliffs at Lake Keowee lifestyle, from golf and tennis to fitness, boating, equestrian and even off-road motoring. 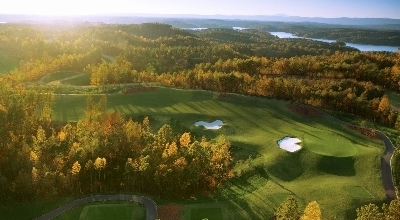 A challenging and rewarding experience for golfers of all ages and skill levels, the Keowee Springs golf course is one of Tom Fazio’s most scenic and uniquely designed layouts. Completed in 2008, it incorporates three loops of six holes and a set of family tees to provide the flexibility for families to play together without committing to all 18 holes. The course is a gentle, rolling mountainside layout with long-range views of Lake Keowee. Experienced golfers should be prepared: the back tees are every bit the championship golf experience. Send me more information about Keowee Springs! Residents who are horse lovers can access the Equestrian Center at sister property The Cliffs at Keowee Vineyards. Here they’ll find facilities and programs in which members can enjoy access to more than 200 miles of scenic riding trails. Trails pass through Jocassee Gorge State Park, starting with the cool, shady trails right within Keowee Vineyards. Lake Keowee is the backdrop for the good life at The Cliffs. The Beach Club at Keowee Springs is accessible by boat, with more than 25 boat slips available. You can motor between each of the two Lake Keowee communities at The Cliffs by boat, tying up at community docks or boat slips while you play a round of golf or enjoy waterfront dining at the clubs. The water is also the place to be for spending quiet mornings scouting for bass fishing spots or passing the afternoon on deck as your family water-skis, soaks up the sun or explores quiet coves by kayak. The Cliffs at Keowee Vineyards’ full-service marina offers boat storage, a ships store, wet slips, fuel dock, dry storage facilities and launch capabilities. Send me more information about Keowee Springs! Enjoy views of the lake, mountains and woods. Send me more information about Keowee Springs! A magnificent clubhouse brings the outside in. Enjoy a comfortable four-season climate. The Lake Keowee region lies at an average elevation of approximately 1,000 feet above sea level, enjoying a mild four-season climate without the snowfall and extremes of weather found at higher elevations. From Keowee Springs, Clemson University is just 15 minutes, Asheville and Greenville about an hour. Nearby Greenvile offers an award-winning downtown area, where its shops, restaurants and galleries surround 26-acre Falls Park and the Reedy River Falls. Clemson is home to the 295-acre South Carolina Botanical Garden, which features the most nature-based sculptures in the country. Brevard is home to the Brevard Music Center, one of the premier teaching and performing institutions in the nation. The 500,000-acre Pisgah National Forest is known as the “Land of Waterfalls. Send me more information about Keowee Springs! With your Cliffs membership, play some of the country’s most acclaimed golf courses. Plan to spend a weekend at The Cliffs at Keowee Springs. During your time you can explore pristine Lake Keowee, hike to the top of an ancient mountain, play some of the country’s most acclaimed golf courses, taste southern-inspired cuisine and meet welcoming residents standing ready with red carpet treatment. You’ll also get to experience what life at The Cliffs is truly like, as you wake up after a night spent at one of their magnificent homes set on a peaceful, wooded homesite. Contact The Cliffs today to begin planning your visit. One of their sales executives will plan a visit based on your interests and goals. The Cliffs is easy to reach and impossible to forget. Start your journey now. Send me more information about Keowee Springs!